'CE' marked and supplied with Certificate of Conformity to meet Health & Safety Regulations. Our Forklift Adjustable Hook attachment is a simple and cost effective way of safely hanging a load under the forks of the lift truck. The Forklift Adjustable Hook can be adjusted to suit a position anywhere along the length of the forklift fork, therefore giving you more flexibility when it comes to handling loads of different sizes or where there are different reach requirements. To safely ensure the Forklift Adjustable Hook is retained to the forklift forks, the unit is supplied with two large 'T' screws that will allow the hook to be tightened to the fork from the underside. 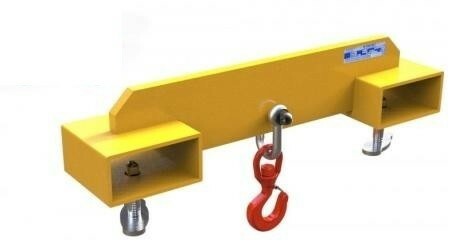 The Forklift Adjustable Hook comes supplied with a high quality hook and shackle, and like all our forklift attachments, comes supplied fully tested and certified for compliance with the latest Health & Safety Regulations.